Akbar the Great (1542-1605) - Akbar the Great was the third emperor of the Muslim Mughal Empire and is often considered its greatest. He was the grandson of Babur, the empire's founder, who also happened to be a descendant of both Genghis Khan and Tamerlane. 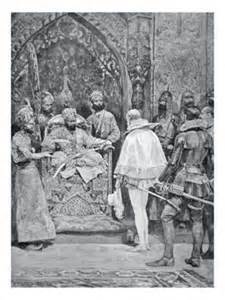 The Mughals were originally a Perso-Turkic people who rose out of Central Asia in the early 16th century. But the already established Safavid Empire in Persia made it difficult for them to expand any further in Central Asia, so they penetrated southeast through the Khyber Pass into the Indian subcontinent and became largely an Indian empire. Akbar came to power in 1556 when he was only thirteen (although under the auspices of a regent named Bairam Khan) and ruled until his death in 1605. His tenure as emperor can be divided into two halves. The first half was marked by expansion. At the beginning of his reign, the Muhgal Empire occupied southern Afghanistan and northern India; but by the end of it, he had succeeded in extending its power over most of the subcontinent. Within his lifetime, he roughly tripled the size of the Mughal Empire. In the process, thousands were killed as he conquered his way through central and into southern India. At the same time, he proved to be very much an enlightened emperor. He himself was a devout Muslim, but he did not impose Islam on his citizens. Those who were brought into the kingdom as a result of his conquests were allowed to retain their original faiths (mostly Hindu). Not only that, but he also abolished a tax imposed on non-Muslims and even appointed many to posts within his government. He even expressed interest in other religions as he often invited scholars of Hinduism, Buddhism, Christianity and Zoroastrianism to his court to learn their teachings. In addition to religion, he encouraged the spread of culture and knowledge throughout his realm. As an educated ruler, he maintained a library of some 25,000 books on virtually every subject of the day, and written in all the languages throughout the region - Persian, Arabic, Sanskrit, Greek, Latin and others. It was staffed with scholars who translated many of the works into other languages. After a nearly 50-year reign, he was succeeded by his son, Jahangir.